Grand Canyon is a 1991 American drama film directed and produced by Lawrence Kasdan, and written by Kasdan with his wife Meg. Featuring an ensemble cast, the film is about random events affecting a diverse group of people, exploring the race- and class-imposed chasms which separate members of the same community. The film was produced and distributed by 20th Century Fox and was released on Christmas Day, 1991. Grand Canyon was advertised as “The Big Chill for the ’90s”, in reference to an earlier Kasdan film. 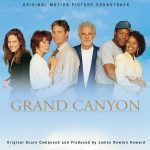 Grand Canyon: Music From the Original Motion Picture Soundtrack was released in 1992 on Milan Records, composed by James Newton-Howard.